The Mizner Ballroom was restored and custom designed with our clients in mind, making it a very versatile and sophisticated event space. It is a popular setting for corporate events and for event hosts seeking a modern and sophisticated ballroom. 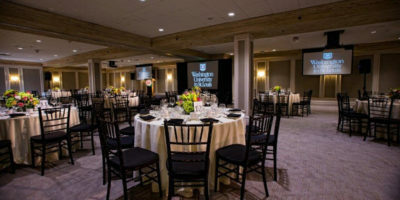 The Mizner Ballroom boasts many unique features including: updated audio visual technology, recently renovated neutral wood tile floors, magnificent barn doors (for making a grand entrance), and Mizner's signature pecky cypress ceilings.